“What’s the date again?” I ask myself as I reach for my phone. I have to return some calls from yesterday – or wait – was that yesterday? Nope. They are from Monday and Tuesday – today is Thursday. Great, I just woke up and I’m already behind. It all started Saturday night (back when I still knew what day it was) at 11pm. Elsie woke up screaming. This probably doesn’t seem to strange to you – she’s a baby isn’t she? YES! Elsie is a baby, but she is a baby who, just like her mama, LOVES her sleep. After a difficult pregnancy and a challenging delivery/postpartum, I was blessed with a baby who sleeps. Praise the Lord. I knew that this was coming, all of the baby books and blogs told me to be prepared, but how can you really prepare for her 9 month sleep regression AND a tooth coming in all at once?! Monday morning I woke up with the head cold that has been going around. My husband had it Friday-Saturday, although like most husbands, he recovered quickly. He swears it’s not the same cold, I promise him that it is – I just also have a child feeding off my immune system on top of trying fighting off the virus. He lovingly gives me a hug, acknowledging my feeling of defeat. I can imagine her sitting beside the wood stove, praying herself through days like this, finding comfort in her Heavenly Father. Who is someone in your life who inspires you to keep going? I have been reading through the story of Esther in my daily devotional. The only way that I’ve ever really heard the story of Esther is through the VeggieTales version – which, for what it is worth is a great learning tool for children – but as a 27-year-old woman, I figured I should probably have a better understanding of this prominent woman of the Bible. As I wrote this, I finished about a page of writing, when I went to save the document, Microsoft Word shut down without saving anything that I had just written. I did all of the restore options that I could to retrieve it. I walked away from my computer feeling frustrated and defeated – like I had just wasted an abundance of precious time in my day. That’s when it hit me. The main lesson that I’d learned in Esther so far was patience – and yet given the opportunity, I completely failed in having any. Its like God was asking me to take a read through the first couple of chapters all over again to remind me to implement what he is trying to teach me. For those of you who don’t know the story of Esther, I encourage you to read through it, slowly. Esther is a unique book of the Bible because there is no actual “response” from God throughout it – but Esther and Mordecai’s faithfulness to Him is what we learn from. During King Ahasuerus’ 3rd year of reign, Queen Vashti refuses to comply with the King’s request when she is asked to appear at one of his celebrations. This decision embarrasses the King in front of his people. King Ahaseurus and his nobles decide that she will be removed as Queen to make an example out of her – lest she encourage others wives to also disobey their husbands. She would be replaced with a new virgin Queen who would be more worthy of the name. Some time later, they finally got around to starting the search. Enter Esther, niece of Mordecai (a Jew whose family heritage has a long and violent history with the Amalekites, the family in which Haman – the King’s right hand man – belongs to. You can follow up with the history throughout the Old Testament: Exodus 17, Numbers 14, Deuteronomy 25, 1 Samuel 15, 30, 2 Samuel 8, 1 Chronicles 18 just to name a few.) Esther was well liked throughout the beautifying process and “fast tracked”, if you will, in to see the King. Esther followed Mordecai’s instruction to not reveal her ethnicity, as he knew that it could stand in her way. She won the favour of the King and became Queen during his 7th year of reign. Mordecai soon overheard a plot to kill the King. He relayed it to Esther for her to warn the King, which she did on Mordecai’s behalf. The plotters were then hanged and the King remained safe. After this, Haman was honoured by the King and promoted above all officials – with this promotion came the expectation that he would also be bowed too by the King’s subjects. Mordecai refused. Word got back to Haman that Mordecai was a Jew and he was filled with rage. He approached the King and told him that there was an ethnic group causing a whole world of trouble. He convinced the King that it would be in his best interest to just do away with the ethnic group as a whole – an opinion that was solely based on his hatred for Mordecai and their family history. This was in King Ahusaerus’ 12th year of reign. Are you following this?! We started way back in his 3rd year and we are now full speed ahead into his 12th year. When you’re a kid, even as an adult, it’s easy to read these stories and think that one thing happened after another – bam, bam, bam – movie over. But that’s not accurate at all. This story is currently in its 9th year. Can you think about the last 9 years of your life and all that has happened? Okay, back to it. Haman orders a decree that on one particular day, the King’s subjects to are purge the world of the Jews – men, women and children – and loot their property. A little harsh eh?! This order caused panic amongst the city of Susa and all other regions- right under the King’s nose. Mordecai tore his clothes and put on sackcloth and ashes, went into the middle of the city and cried out. Not cried, not wept – but wailing loudly and bitterly. Esther’s servants told her about the decree and Mordecai’s response, she was distressed. Mordecai then persuades Esther to go before the King – unannounced, I might add, which had the chance to carry the death penalty depending on the King’s mood. BAM. Just like that – PERHAPS you were MADE for this moment – right here. Mordecai had faith that no matter what Esther’s decision would be, that His Sovereign God, would deliver the Jews regardless but that he was giving the opportunity to Esther. All she had to do was step out in faith, trusting that God was in control. Let’s also quickly look back, Esther was made Queen in the King’s 7th year – we are now in his 12th year – therefore Esther had already been Queen for 5 YEARS. She has been sitting in this royal position, which I can only assume that she felt not worthy of, having no idea why she is there or what God is doing with her. To finish off the original story of Esther, she invites the King and Haman to multiple private banquets before she has the nerve to tell the King that if he follows through with this plan – orchestrated by the evil Haman – that he will then need to kill his trusted Queen because she herself is a Jew. The king is appalled that this decree has happened but tells her that unfortunately, he cannot take back a decree with a royal seal. Instead, he sentences Haman to death for his part in this, and allows Mordecai (whom he did end up honouring for saving his life from the assassination plot, much to Haman’s dismay) to be promoted to his right hand man and issue another royal decree – calling the Jews to take up arms against those who come to hurt them. When the day came the Jew’s claimed victory in the name of God over those who threatened them. Because of Esther’s faith in her Heavenly Father, God was able to use to her to further his Kingdom. Where in your life is God giving YOU the opportunity to step out in faith and take your place as a pivotal part in serving and furthering His Kingdom? “A bath tub and fried chicken” – A Pregnancy and Birth Story. Now that I’ve had time to process our pregnancy and birth with Elsie, it’s easier for me to put into words. It was an emotional and physical roller coaster. We started with severe pregnancy sickness – I refuse to say morning sickness, as that’s not even close to an accurate description – unless morning means all day. We were prescribed some medicine and we were on a roll back to health! I lived 40 mins from my work and had long days, which means I was up at 5am and returned home between 7:30-8pm most evenings. At about 4.5 months long, we lost my Oma and Aunt within hours of each other. You can likely imagine what that experience as a hormonal, pregnant woman looked like. The week of the funerals, my left arm became very sensitive and tingly. After a couple of days, a strange bubbled rash appeared and I was feeling really under the weather. Something wasn’t right. We called the Dr. on the way home and booked an appointment for the next morning. Friday morning he took one look at the rash and said Shingles. Shingles is a version of the chicken pox that lays dormant in your nervous system – it strikes when your immune system has been comprised. Having not been well during pregnancy so far and the events of the previous weeks had made me a perfect candidate. By Saturday morning, I’d lost any practical use of my left arm. My dear Patrick wrapped and rewrapped my arm countless times over the next 3 weeks. This pregnancy was giving me a run for my money. After the shingles, we realized the danger of the stress that I was under and that if I was going to continue with a healthy pregnancy, I needed to take a step back. We decided to take an early Maternity leave, starting 2 months before my due date. Once I had a chance to sleep/nap when my body needed it and had the opportunity to eat proper meals, I quickly gained back my health and some extra energy! It was such a blessing not only for me, but for everyone around us. Patrick and I were able to enjoy the last 2 months of pregnancy together in such a positive and excited environment. Shortly into my maternity leave, another Aunt of mine had passed away. Our beautiful pregnancy was an abundant amount of joy, surrounded by a large amount of sorrow. Throughout it we learned what it meant to truly praise God in every circumstance. Shortly after that, on a not so positive day, I was suffering from constant Braxton hicks and what they call “lightening pain” – which I will describe as a knife ripping through your cervix – I could barely make it through my grocery trip to Wal-Mart. I quickly left my cart and shuffled out to the car with tears streaming down my face. I came home, warmed up some left over fried chicken and got in the tub. That’s when I realized I was experiencing the epitome of pregnancy – you are bound to have at least one day, where all you need to do is to sit in a warm bath, eating your fried chicken while crying out of control. Our hospital due date was April 22nd, but by my own personal calculations, my due date was April 26th. My sister’s birthday is April 25th and it was the running joke that she would have to share her birthday with this new addition! I even had it marked in my calendar as “the day Tiny Turvey would most likely arrive”. Labour started on April 23rd. While we were puttering around the house, I noticed a huge change in the appearance of my belly in the mirror on our stairs. It all the sudden looked as if it was about of drop to the ground! It was so different then when I had taken a photo just two days before. I had been having Braxton hicks since 6 1/2 months, so I didn’t think anything different about the cramping going on. We went to my in laws house and while speaking to my mother in law, I was describing these Braxton hicks and she gave me a funny look and said “you know those are early labour contractions right?” And I thought, well ya, isn’t that similar to what Braxton hicks are? We went and picked up some Hot and Spicy sausages – an old wives tale. I didn’t have high hopes. I knew that this baby would come when it was ready. That evening, I begged Patrick to rub my lower back for what felt like hours – it was just aching so bad. I was sitting on the birthing ball while he massaged out the ache, I saw a book given to me by my doula sitting on our coffee table. I started perusing through it and got to the section about “signs of early labour”. As I read through the chapter I started checking each sign off in my head, thinking, “hmm, I have that, oh and that, annddd thaaatttt, but I haven’t had any blood yet, so it must not be it.” Alas, 10 mins later I went to the bathroom and there was blood. I went back downstairs and looked at Patrick and said, “I think it may be happening soon. I’m going to go and have a bath and then head to bed – maybe you should think about coming to bed early tonight too.” He said “yep, okay, sounds great.” I don’t think that he even processed what I was saying. After I had climbed into bed, the contractions started to get progressively worse. After about an hour I texted Patrick who was down in his office asking if he was coming to bed soon. He replied with “yep, I’ll likely be up in the next half hour.” It was another 2 hours before he finally came to bed. He walked in to find me sitting on my birthing ball breathing through a contraction. He said “what are you doing on your ball?” And I said “I’m in labour, I said you should come to bed!” And he said “BUT YOU DIDN’T SAY YOU WERE ACTUALLY IN LABOUR!” as he quickly shuffled into bed realizing that he might not get any sleep tonight. By 3 am we were on route to my parents house (where we had planned on labouring because of our house’s distance to the hospital). When we got there we made a comment about the baby not coming on my sister’s birthday after all. I followed it by saying, “Well, with my luck this baby still won’t be born until tomorrow.” Sometimes your gut knows more than you do. It was a long day of early labour with slow progression. Tiny Turvey was half “sunny side up” so we did a very painful routine to help her turn around. At about 7:30pm the contractions were every 2 mins apart and were very intense. The midwife came to check my dilation but couldn’t tell if my water had broken or not – so we packed up and headed to the hospital. When we got there, I was still only 3-4 centimetres dilated. The contractions stayed just as intense and grew as the night went on. They broke my water around 10pm to try to help Tiny Turvey along. The baby seemed to be stuck on my right hip and wasn’t entering the birth cannel correctly. Only half of my cervix was dilating. By 1am I was still only 4-5cm. I was in the shower for what felt like hours to help with pain and use gravity to the best of my ability. Finally, at 3am still sitting at 5cm, 28 hours into labour and after much deliberation, we decided to get the epidural. Thank goodness for Patrick, as he had the weight of the world on his shoulders as he weeded through these decisions alongside me and for me. I remember looking at my doula saying “I need the medicine, I cannot do this on my own anymore.” She and midwives agreed that in the middle of my second night with no sleep, I needed assistance to continue. I remember the midwives saying, “The Dr will be on the floor in 15 mins, we’ll have him come and assess you.” And I remember responding with, “I understand that the Dr. will be on the floor to assess me, but he’d better be coming to assess me with some pain medication in his hand, not going to get it after he is done and then have me wait an additional 15 minutes.” At that point, they decided to page the Doctor instead. I was so done. After receiving the epidural and pitocin around 4am, I finally fell asleep for a couple of hours. When I woke up, this wonderful nurse was siting beside me. She talked to me about everything under the sun. It was so good to feel like a human being, even just for a moment. Once 7am hit, I was fully dilated. Patrick woke up to me spread eagle, being assessed by the nurse. We were ready to push. It was 45 mins of pushing when the Dr. came in to see how things were going. After one look into the birth canal, he, in the most kind way, let Patrick and I know that our Tiny Turvey was stuck, that the baby will not come out naturally without assistance. He told us that he would be prepping the room for a double set up in the OR – which means that he’d try to use forceps first, but would be prepared to do a c-section if that wasn’t possible. Once he left, the midwives jumped into action! They were determined to allow Tiny Turvey to move down just a little more to help me have the vaginal delivery like I wanted. About an hour and a half after we started pushing, we were moved into the Operating Room. There must have been 15 people in there, between the team for me, team for baby, team for the Dr, plus my midwives. I was quickly given some more epidural and strapped down to the table. The Dr. decided that he would be able to reach her with forceps and told us to be prepared as she would likely have a bad cone head from being stuck for so long. It felt like forever but it was only a few minutes, the room fell silent at the request of the Doctor. As Tiny Turvey was born, he held her up and Patrick exclaimed loudly, “IT’S A GIRL!” He looked at me, with tears streaming down his face as they placed her on my chest, “We have a daughter” he said, in the most sincere and joyful tone of voice. I struggled as I was strapped down on the table and couldn’t reach for her, it felt so amazing once the midwives freed me and I could wrap my shaking hands around our perfect little girl, with a perfectly shaped head full of hair. 36 hours after labour had begun, our little Elsie Jayne was born at 9:13am on April 25th, sharing a birthday with her lovely Aunt after all. I had quite a bit of damage down below, with an episiotomy accompanied by a 3rd degree tear – we knew that it would be a long road of recovery ahead. I am so thankful that God blessed me with such a serving Husband, who cared for me and Elsie, day in and day out post birth. I had yet to understand the depth of his love for me before this, not because of a lack of him showing it, but just in the sudden new love for Elsie that we both shared and in turn, shared more love with each other. I fully believe that the birth of a child is one of the few times in life where the earthly realm and the Heavenly realm come so close that you can almost reach out and touch through them. The name Elsie means “God is bountiful” and the name Jayne means “God has been gracious”, throughout this whole process we have felt God’s love ever so plenty and his grace ever so near. We thank for Lord everyday for our sweet little Elsie and for our team that supported us through it all. To our midwives, doula, nurses, doctors and our families, some of who were in the waiting room, praying and showing their support in the ways that we needed it most. They said there’d be a glow. They said there’d be a glow. The only glow I had, I paid $15.95 for at the local drugstore and came in the form of a bentonite clay mask – which I was using to control this outburst of adult acne that accompanied my first trimester. No one tells you that part about pregnancy. The down, the dirty, the reality of the toll growing a human takes on your body. No ones tells you how early the “mom-guilt” starts from not only those around you but even in your own subconscious. Guilt. No one told us that this was pregnancy. During our first ER trip after a couple of days of throwing up – 7 weeks in – I laid on the bed with my eyes closed. Thinking of my husband who I know is exhausted, sitting beside me in the middle of the night, holding my hand while they change the IVs. The one thing that I’ve wanted, dreamed of, imagined my whole life – was the joy and blessing that it would be to carry a child. Under the incandescent hospital lights, no one told us that this was pregnancy. In this time in a women’s life when I expected to feel the most loved, the most surrounded by God’s grace and the most enlightened as a woman – even through the support of my loving, serving husband, our awesome families and encouraging text messages – I have never felt more alone in my life. I could barely stand the idea of being hugged, let alone snuggled or kissed because I was feeling smothered, not by anything physically around me, but by the pressure of the broken expectations. So I stopped making plans. Soon after, they stopped checking on me too, as if I was contagious. I wasn’t, I was just defeated. Defeat. No one told us this was pregnancy. Suffering. No one told us that this was pregnancy. During our second ER visit – 15 weeks in – after 5 straight days of crippling sickness we finally decided to get the prescription and take the medicine. I cried. I have never felt like I’d failed as much at anything as I did at pregnancy – the one thing that I felt I was made for. I was one of the lucky ones. At 5 months pregnant and a few weeks into the diclectin, I’m on the mend. Sick days are fewer and far between. I still take my mornings slow and my evenings short, but I am finally feeling a sense of comfort in carrying a child. A comfort that I believed didn’t exist. Everyday I am in disbelief that God continued to nourish our child through days I could not – that after a month of very little food, Tiny continues to grow. The lessons I’ve learned throughout this time seem endless. I am greatful for the ability to carry this particular child for as long as I have and hopefully as long as needed, when others often miss this experience. I pray everyday that God’s will be done in our lives, as much as others. I can’t wait for the day that I will get to hold Tiny in my arms and share with them how loved they are. I decided to write this brutally honest piece about my experience, not to depress you or discourage you, but to instead share that even the most wonderful blessings aren’t without their own trials. Leaning not on our own understanding is one of the most terrifying yet comforting calls that we could have on our lives. God works in mysterious ways. He shows himself in the places that we’d least expect him, on days that we’d least be looking for him and surrounding moments where he knows that we’ll doubt his plans. God’s promises are bigger than my own plans, even when they feel smaller. Mine will never compare in greatness. Whatever I believe my worth to be, whether in experience, success or money, or family. I know that my worth to him is much more than any earthly measure. My disappointments and failures are part of what He often uses for his glory. 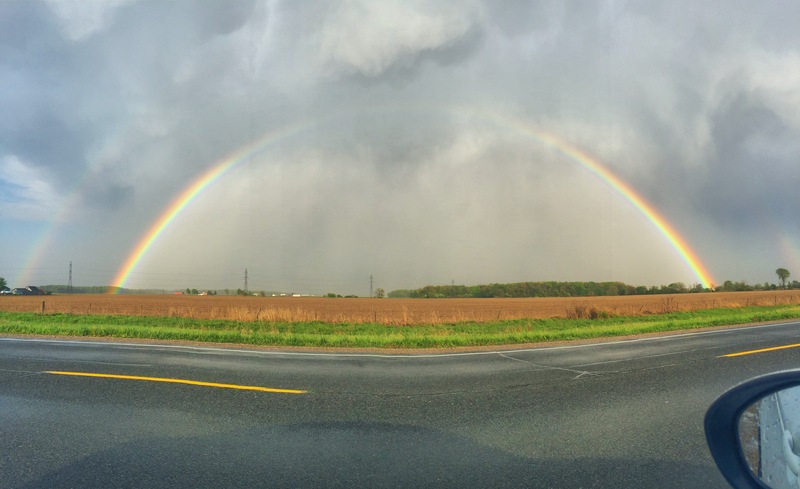 On my drive home from work, I pulled to the side of the road to take in God ‘s reminder of his promises – to love me, to provide for me, to give me hope and a future. Today, I am disappointed but I am not defeated because He was already there.